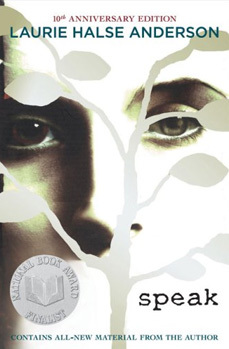 Posted in Banned Books Week, Contests, Teaser Tuesday	by Cait H.
Speak is just one of three books that have recently been challenged in a school district in Missouri, USA. Natalie @ Mindful Musings decided to put together an event in which bloggers write reviews, host giveaways and post about the three novels, and book banning/challenging in general. The event runs from today until October 3, one day after Banned Books Week ends. If you’d still like to sign up, e-mail Natalie or comment on her blog letting her know you’re interested. I’ve just started reading Speak and will have a review up during my own Banned Books Week event, and I’ve already written a post about the subject. The giveaway can be found below today’s Teaser Tuesday. Teaser Tuesday is hosted by MizB @ Should Be Reading. I am a good girl. I go to every single class for a week. It feels good to know what the teachers are talking about again. My parents get the news flash from the guidance counselor. They aren’t sure how to react – happy because I’m behaving, or angrier still that they have to be happy about such a minor thing as a kid who goes to class every day. The only extra entry I am offering is a chance to spread the word about banned books, Speak, Twenty Boy Summer, Slaughterhouse Five, this event and this giveaway. No matter how many times you spread the word, only one extra entry will be given. I want this contest to be open and approachable to as many people as possible. Because of that, this giveaway is also international. I don’t think one person should decide for me what I can and cannot read. Thank you for making this contest !